The climate change is causing Canada and North America to become more hospitable to the black legged tick. They are creeping north and bring Lyme disease with them. We already had enough other forms of ticks. We didn’t need these too. 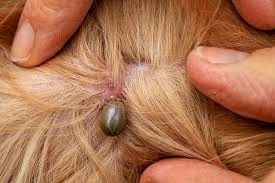 Pet owners must check their pets for ticks. Ticks are parasitic arthropods that feed on blood and carry a variety of diseases. 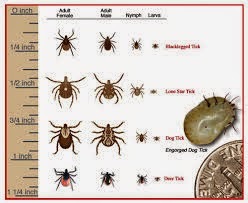 To search your pet for ticks start by running your hands over it’s body feeling for lumps, bumps or abnormalities. Pay special attention to ears, necks, skin folds and crevices. If a tick is found it will need to be removed. Wear latex gloves. Using tweezers or a special tick removal tool, grasp the tick at the point of attachment. That is as close to the pets skin as possible. Do not squeeze the tick. It could cause the tick to push the blood and bacteria back into your pet. Pull the tick straight out. Some of your pets skin may come off. Then flush the tick down the toilet. Clean the spot on your dog with a mild soap and water and watch the spot for signs of irritation or infection. Contact your vet if the spot doesn’t clear up or if you see signs of illness or infection.